One of the important trends of the past few years has been the dramatic expansion in corporate, industrial, and institutional climate commitments. These organizational commitments have become arguably the leading edge of climate action. There are enough different commitments—renewable energy usage, energy efficiency targets, normalized greenhouse gas targets, science-based targets, policy-oriented targets—that getting an overall view of the landscape and understanding how specific companies’ efforts align with the market and with their peers has been challenging. 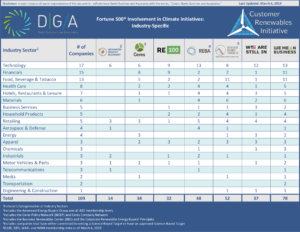 DGA’s Corporate Climate Tracker looks at the Fortune 500, and summarizes their participation in a portfolio of major climate initiatives. We’re offering the Tracker to help policymakers, utilities, markets, and other stakeholders understand companies’ efforts and the opportunities available to accelerate them. DGA believes that companies will continue to be a critical driver of the world’s transformation to clean, renewable energy and to deep reductions in greenhouse gas emissions. The above chart is a basic snapshot of the data represented in the Tracker. A high resolution version of the chart is available as a PDF here. The full data by company is available for download below as an Excel chart. Interested in learning more? Read our blog post on the Tracker or visit the Customer Renewables Initiative page. We welcome feedback on the tool. Please contact William Sherman with comments, data updates, and more. For inquiries about DGA services, contact Blaine Collison.